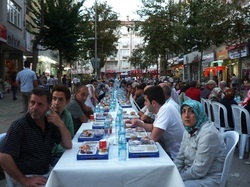 Community iftar meal Cevezli, 2011. I have been home exchanging since 1990. I have had--at this point--18 home exchanges in Western Europe. 3 more are planned for July-August 2011 (home exchanges in Toulouse, France, & Salamanca, Spain, and an exchange of home hospitality in Bordeaux, France, as well). It is a terrific way to interact with locals and have a vacation at a rock bottom price. Do it once and you will be convinced. For logistics check my piece on How to Do a Home Exchange. Why do I label Turkey as "The Best Home Exchange Ever". It was just so different. I came home thinking more positively Islam and knowing I could deal in a culture where the language was a real challenge. I learned more than I ever expected--and I have continued learning about this vibrant culture since I returned. Turkey is not a conventional Muslim state. It is, more or less, modern. It is also not a destination that I would recommend for a first time home exchanger--or first time overseas independent traveler. But, if you get an offer from an unusual destination, you step on it and accept immediately. It may never come again! This is not a history lesson, but you cannot understand Turkey without learning about Mustafa Kemal aka "Ataturk" ("Ataturk" means "Father of the Turks"). He was the Turkish military genius who founded modern Turkey--and his photograph is everywhere in Turkey. He was president from 1923-1938 and modernized the country. He gave Turkey a basically secular government, banning veils for women and separating the state from religion. While there has been some push back in recent years from more religious Turks, the compromise still holds. I never felt uncomfortable as a single woman. I felt welcome. While I worked with Pimsleur to learn a little Turkish before going, my communication skills were limited. I remember the first time I tried to get from my apartment in Cevezli to tourist Istanbul. What a mess! Turkish roads often have no names--leading to a variety of adventures in taxi cabs with similarly confused drivers. I was left almost no information. To figure out how to get to downtown Istanbul was a real challenge. First, I located my house on mapquest/google maps and then tried to imagine where the bus/train routes might be. There were two methods: a "dolmus" (a sort of gang taxi that you just hailed at the corner) or a short walk to the train station where you could get a train to Hydarpasa. Hydarpasa was the main transit point for ferries across the Bosphorus. I was way on the Asian side and the tourist sites were on the European side. The first time was a total mess. I worried about how to get "home", for example, after I got to the tourist sites. When I got to Hydarpasa, I had no idea what to do. Some kind person, who could not speak English, used his cellphone minutes to call a friend for me. The friend got on the phone and explained where I should walk and I found the terminal. This was not an isolated incident. It happened more than once on my trip--and this from people who earn very little in comparison to Americans. What hospitable people! Do you see the photograph at the top of the page? I was in Turkey during Ramadan (called Ramazan in Turkish). That presented its challenges. With lots of women wearing hijabs in my neighborhood, I did not eat in the street during the day. If I wanted a meal locally, I went into a restaurant and ate in the rear. They generally serve you in the rear during the holiday period. And, yes, Ramadan is a holiday period. While observant Muslims fast from sunup to sundown, after sundown it is a continual party--all night. One night I returned "home" and the street was absolutely covered with tables. There was a community "iftar" meal planned. They even invited me, but I did not participate. I wasn't fasting. I used the opportunity to take photos instead. I couldn't imagine the whole community turning out for a meal like this in the US, but, hey, this was Turkey--party on. Not a whole lot of work gets done during Ramadan--it's party time. And the guy who called someone on the cellphone for me--it was not the last time that something like that happened when I had a question. One time I had a question about a street demonstration. Someone called a friend to explain it to me using his cellphone minutes again. Unbelievable! For AlteCocker's second home exchange in Istanbul, look here.